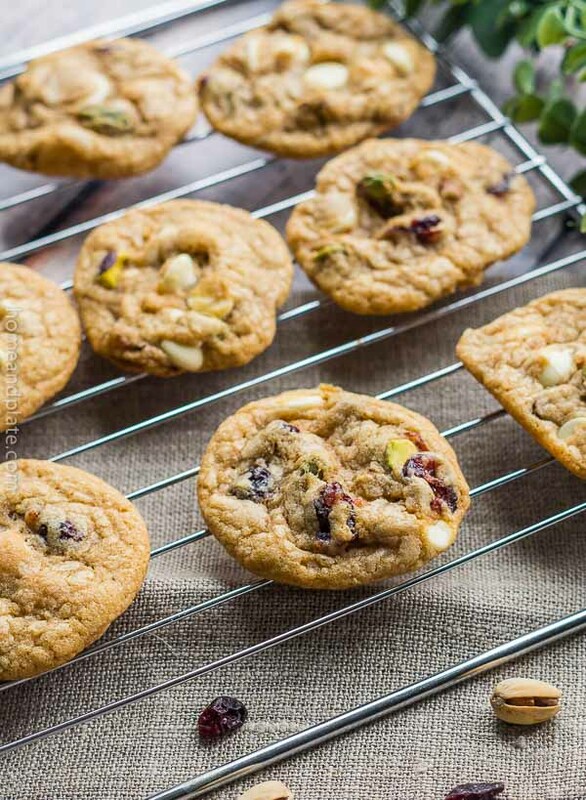 Sweet dried cranberries and salty crunchy pistachios team up together with white chocolate in this recipe. I was looking for a festive cookie for a cookie exchange party featuring the holiday colors of red and green. I wanted something salty but sweet and a recipe that guarantees two dozen cookies. My first batch of cookies fell flat and were too sweet for my taste. A few adjustments and the results are the perfect cookie that’s crispy around the edges with a chewy soft center. There are so many cookie recipes in cookbooks and online that sometimes it’s hard to figure out which one is the right recipe to use. I found this guide from Handle the Heat quite helpful. There are so many factors that go into making the perfect cookie. Because there are so many basic chocolate cookie recipes out there, no two recipes ever turn out the same. Everyone has a different preference when it comes to classic chocolate chip cookies. My mom likes a flatter cookie. I like a chewier cookie. My kids love a cookie that is cakey. 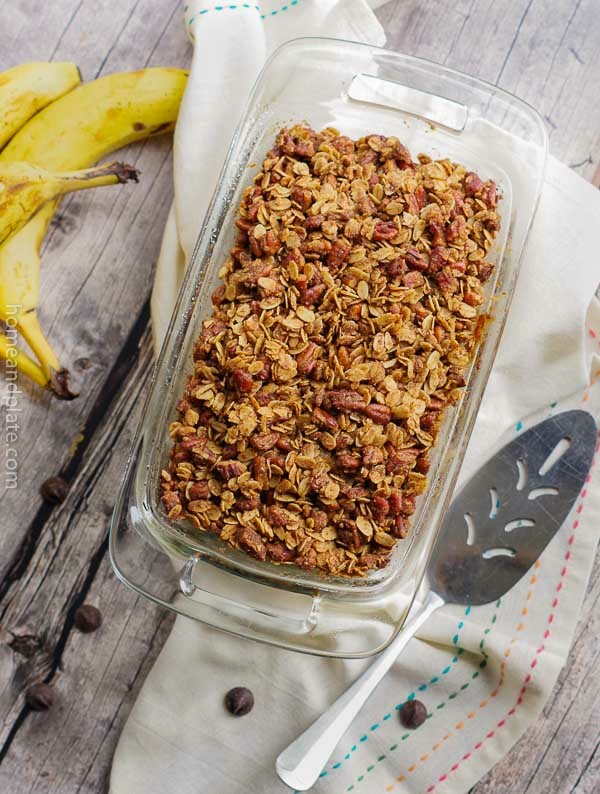 My recipe is a perfect combination that’s sure to please all mouths. Should I use baking soda or baking powder question? I used both. Using both leaveners resulted in a crisp cookie with a soft chewy center. Should I use melted butter or softened butter? My first test run used softened butter and two whole eggs. The result was a flatter cookie. For this recipe, I reduced the eggs to 1 whole egg and 1 egg yolk and used cooled melted butter. This combination was the right one. Should I chill the dough? This recipe has the right flour-to-butter consistency and did not require it. But, if it is too sticky to handle, then refrigerate the dough for an hour beforehand. What can I use other than pistachios? 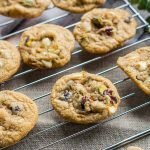 I did use pistachios for this cookie recipe but hazelnuts, walnuts or pecans make a delicious and crunchy substitution. Pistachios can be pricey and I did have to remove them from their shells. Be sure to scroll down for the necessary baking accessories you’ll need to make these cookies. Preheat the oven to 325°F. Line two cookie trays with parchment paper. Melt the butter and cool completely. Using a stand mixer or large bowl, mix together the melted butter and sugars at medium speed for one minute until creamy and the consistency of frosting. Next add in the egg, egg yolk and vanilla and mix for an additional minute. Scrape down the sides of the bowl and mix again until combined. Mix the dry ingredients gradually into the wet ingredients until the ingredients are just combined. 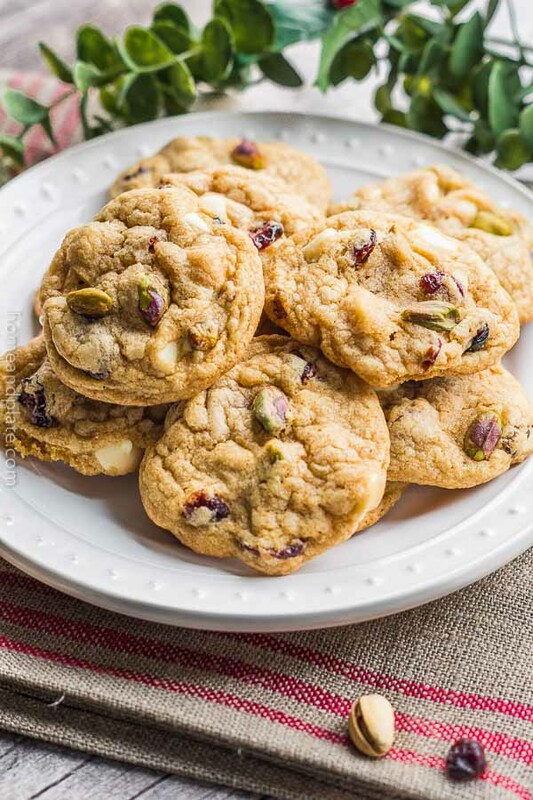 Stir in the white chocolate chips, pistachios and dried cranberries by hand. Roll the dough into 2 tablespoon-sized balls. Place the cookie dough on parchment lined cookie sheets and bake for 15 minutes, flipping the sheet around halfway through baking. 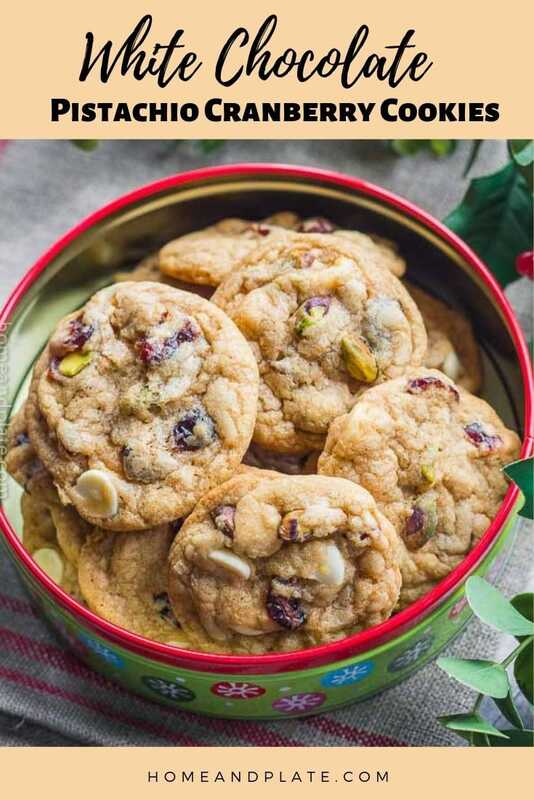 "description": "Crispy along the edges and chewy in the center, these white chocolate cranberry pistachio cookies are perfect for the holidays. ", "recipeIngredient": [ "3/4 cup salted butter, melted and cooled", "3/4 cup dark brown sugar, packed", "1/2 cup granulated sugar", "1 large egg, room temperature ", "1 egg yolk", "2 teaspoons vanilla extract", "2 cups all purpose flour", "3/4 teaspoon baking soda", "1 teaspoon baking powder", "1/ 2 teaspoon salt", "1 cup white chocolate chips", "1 cup dried cranberries", "1 cup salted, shelled pistachios" ], "recipeInstructions": "Preheat the oven to 325°F. Line two cookie trays with parchment paper. Next add in the egg, egg yolk and vanilla and mix for an additional minute. Scrape down the sides of the bowl and mix again until combined. Roll the dough into 2 tablespoon-sized balls. Placed the cookie dough on parchment lined cookie sheet and bake for 15 minutes, flipping the sheet around halfway through baking. 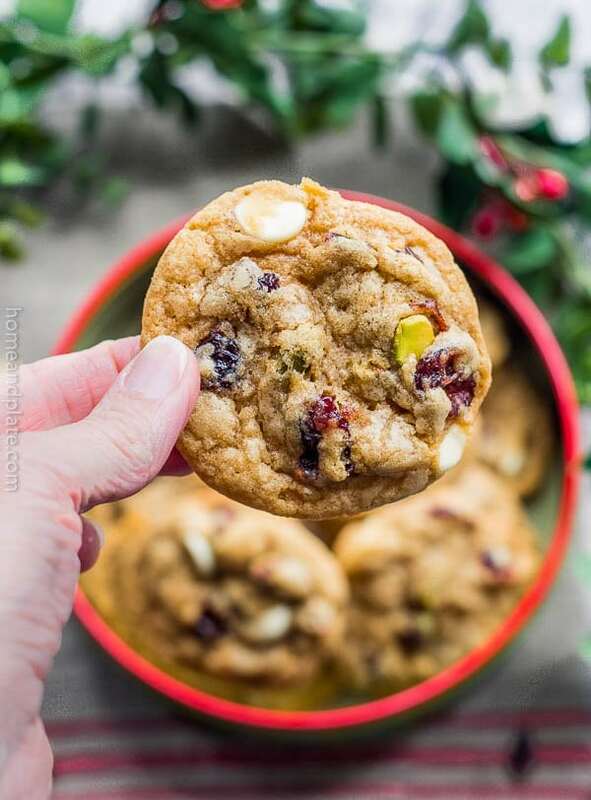 These white chocolate cranberry pistachio cookies are perfect for the Christmas season. I love that they are both salty and sweet which makes the perfect cookie. I’ve never made white chocolate cookies but these look fabulous! 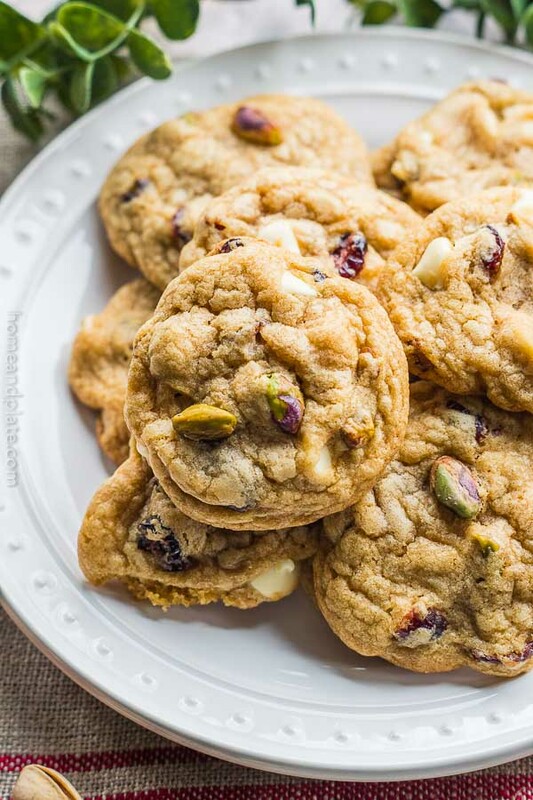 Love the use of cranberries and pistachios! I have some pistachios I bought in Sicily which I need to use up! Now I know what I want to make with them! Thanks Jacqueline…these are the perfect red and green cookies to celebrate the holidays. Enjoy! These cookies look hard to resist! I love the cranberry. They are a favorite of mine and lovely for the holidays. They are the perfect festive treat. White chocolate, pistachio and cranberry! What a fantastic combination of flavors. I’ll have to try these at home.